They’re going for five in a row. The Zac Brown Band have seen the last four single from the album You Get What You Give go all the way to number one on the charts. I’m not sure if an album has ever had five number one singles. I know of a few have been close. Let’s help ZBB get there with their latest, No Hurry. Now that’s a great song. The pace is slowed down to an enjoyable, laid back feel. The guys take on the song about living life and getting by. Sometimes we all have people chasing after us wanting something. It seems like we’re always the ones working and doing the giving. Well those folks can just wait a little while. There’s more important things to do like spend time with friends and loved ones. I think the Zac Brown Band accomplish this point with No Hurry. The song is great for a laid back Saturday afternoon. I like the Zac Brown Band. I finally had the chance to see them live last summer. They put on a show that lasted for over two hours. Now you have to remember that they’re only on their second album. But I guess with 10 singles off those two records you have enough songs for quite some time. Plus the guys worked in new songs and most of the album cuts. It was a great show. No Hurry is a great country song. I like this laid back kind of track. There are uptempo songs out there and songs that get a little depressing. Sometimes we need to take the situations we have in life and just sit back and take things slow. Everything can wait in life. We don’t always need to rush through life and hurry to get some place. Sit back and enjoy the good things. There ain’t no hurry to get to work or to get somewhere. Sit back and enjoy some time with the family or with some friends. That’s a good message and a great message for a Zac Brown Band song. Will this one reach number one on the country singles charts? You as a fan would be part of history seeing this song go all the way to the top spot on the charts. Get out there and start calling those radio stations. 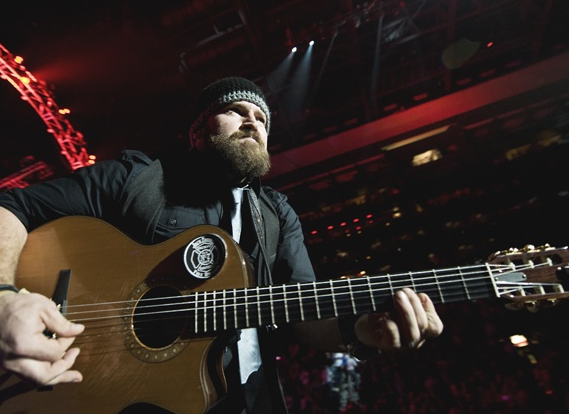 The Zac Brown is about to make history and you can be part of it. And there’s nothing like supporting a great song. I’m going to be listening to this one over and over for some time. The entire album is great. It’s got give number ones!